Growing, pickling, preserving, cooking and eating food is a joyful experience. But what makes it even better is sharing the food we have grown and cooked with the people in our village. It’s the sharing that brings meaning. 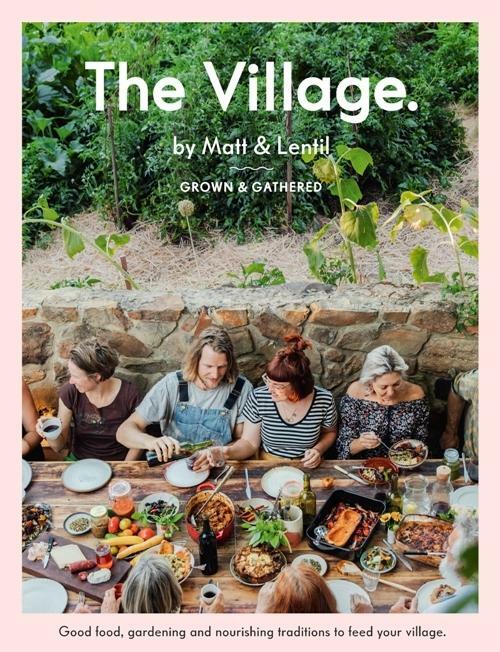 In The Village, Matt and Lentil from Grown & Gathered focus on the life-giving value of cooking and eating with your village - whether made up of family or friends. Wholesome staples, like Kombucha and Sourdough flatbreads. Pickles and preserves, like Pear, lemon and chilli jam and Zucchini pickles. Delicious meals including Honey onion, buckwheat and lentil salad, Nonna’s leek and spinach fritters, and Pan-fried gnocchi, pea and ricotta salad. Desserts like Baked plums, sage and warm cheese, and Raw chocolate and espresso bowls. The Village is about nurturing and being nurtured, by growing, cooking and eating together - whether it’s dropping a loaf of bread around to a neighbour, or spending an afternoon making a big batch of pickles with your mates. It is about food, but beyond food. It is for everyone who wants to embrace the fullness of life in all its mess, for everyone who wants to connect. Because we all deserve it.